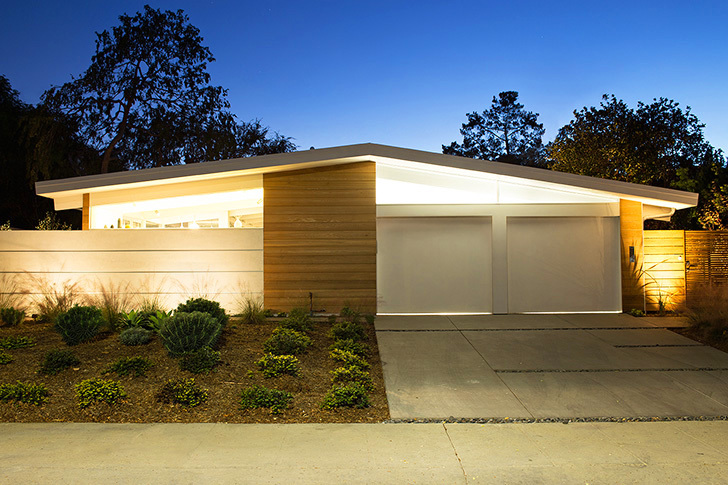 <a href="http://www.klopfarchitecture.com">Klopf Architecture</a> recently remodeled a classic Eichler mid-century home, honoring the iconic home’s style while expanding it to suit the needs of the new homeowner. 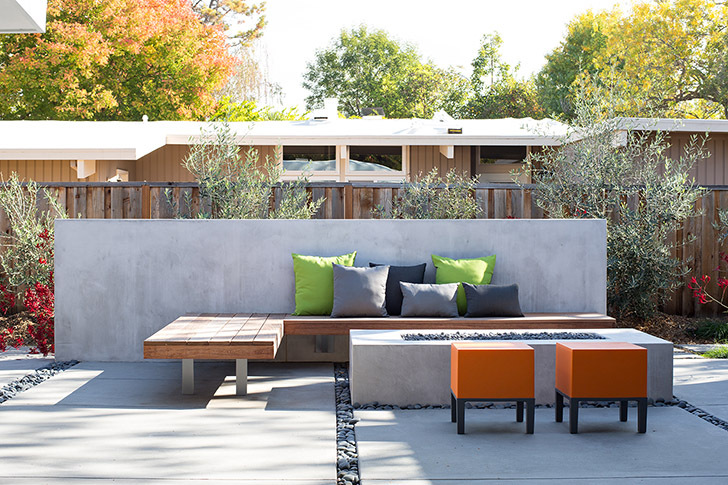 Working alongside <a href="http://www.arterrasf.com">Arterra Landscape Architects</a> and <a href="http://www.flegelsconstruction.com">Flegel’s Construction</a>, <a href="http://www.klopfarchitecture.com">Klopf</a> opened the home to the surrounding landscape. 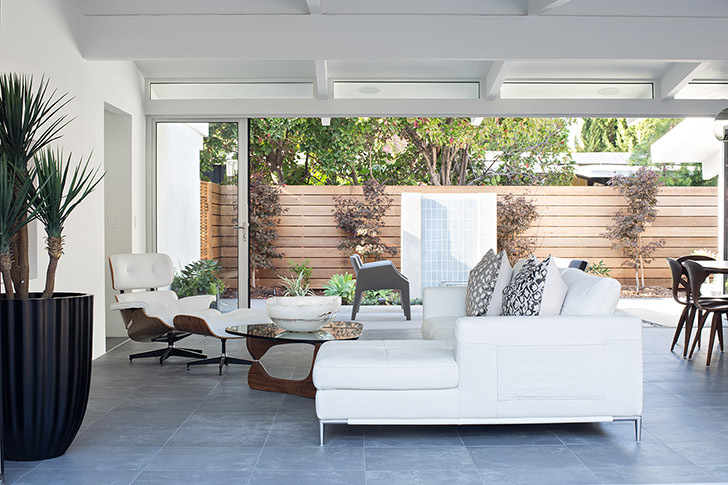 The airy pavilion-like renovation provides the best of indoor and outdoor living, and allows the home to be naturally cooled by California’s breezes. When the homeowner discovered the property, she saw potential, but the existing structure was in bad shape. 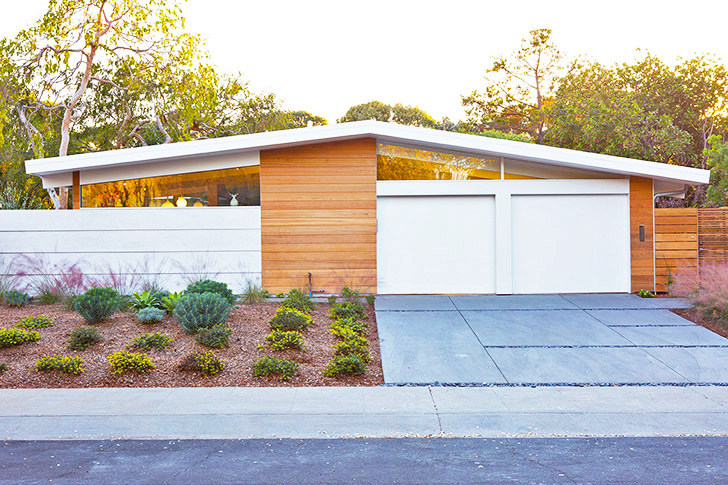 The homeowner turned to John Klopf, founder of Klopf Architecture, because of his experience with Eichler homes. 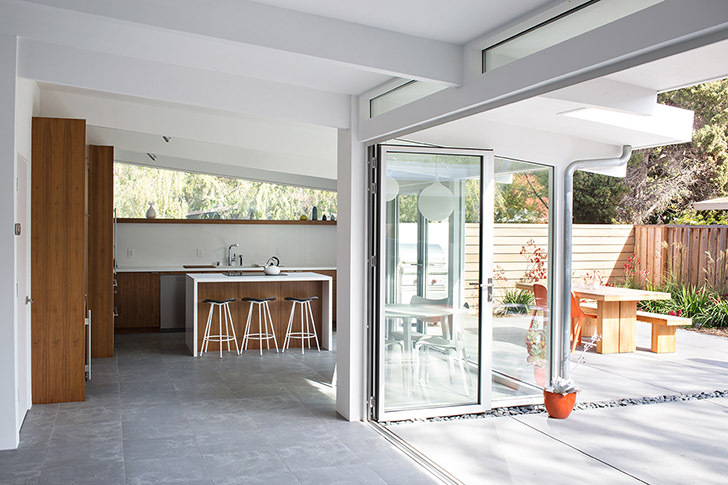 The original glass walls were replaced with Nanawall panels, which can be opened and closed to bring the outdoors in. 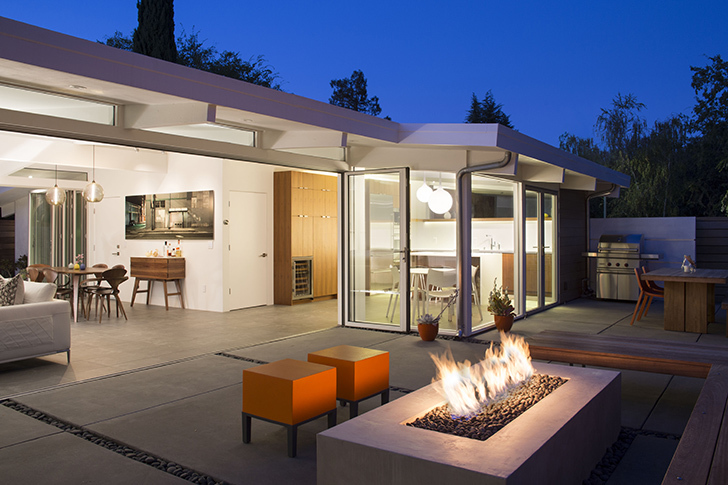 The roof was altered to extend into the yard, providing shelter and to further blur the line between inside and out. 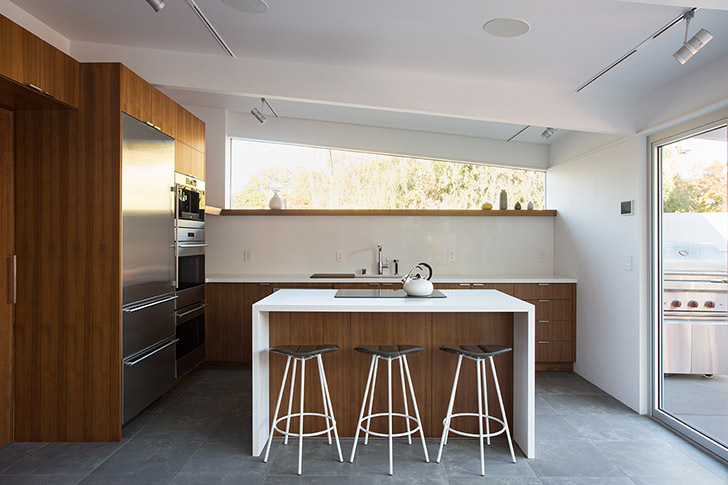 The interior utilizes clean, modern design that is echoed in the exterior. Exterior view of the home. The home has no cooling system, since the ability to open and air the home provides all the cooling needed. 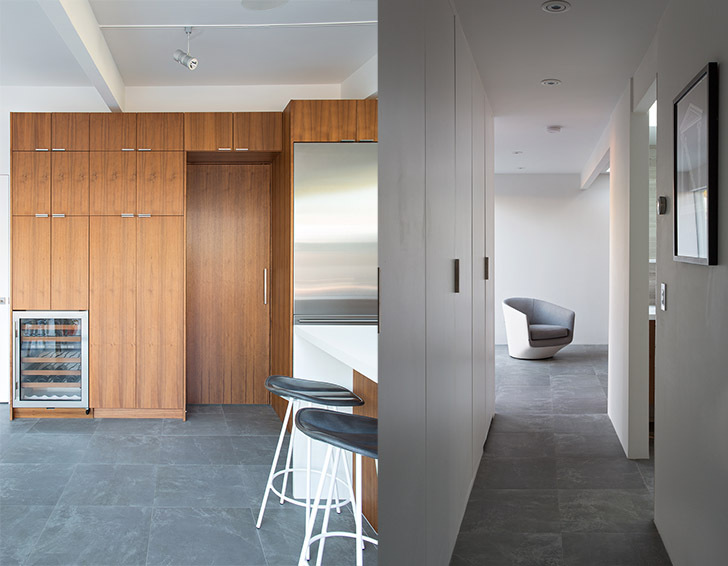 Originally, the home was constructed of two “boxes” which contained the private areas of the home. These boxes were connected by a central glass living space. 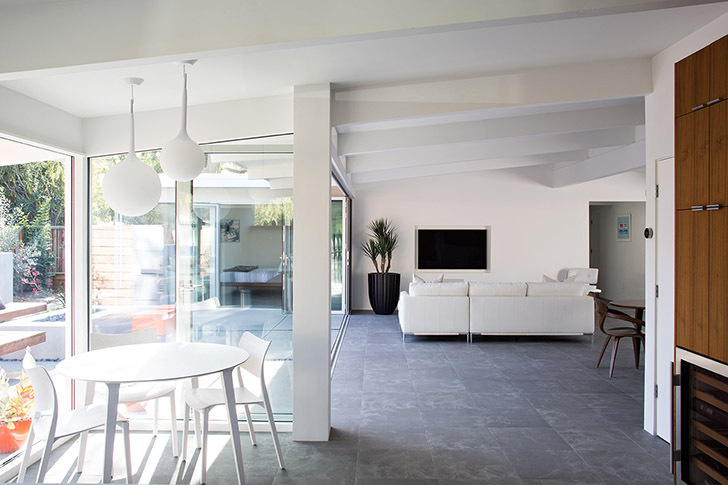 All of the lighting is LED and the home was re-insulated to reduce the need for heat, provided by radiant in-floor heating. 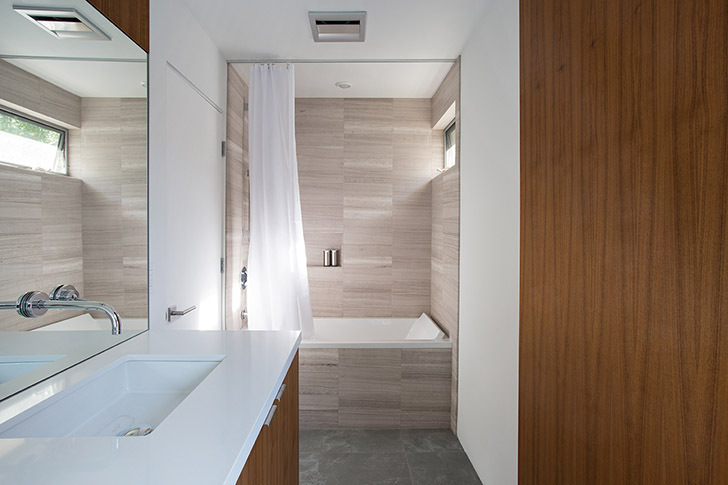 A bathroom in the home. 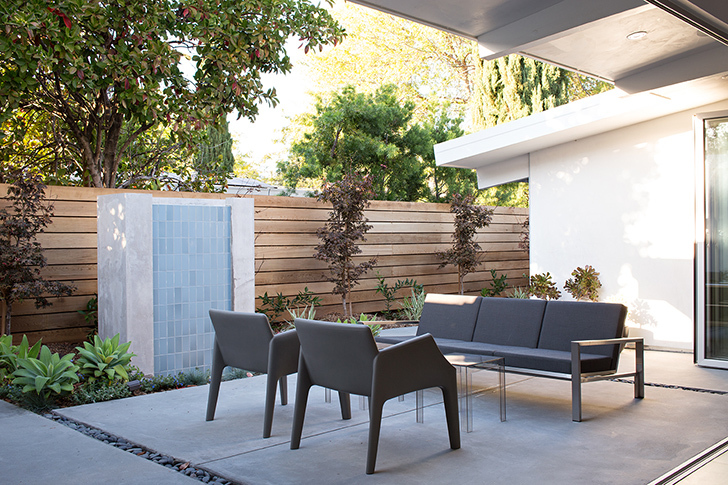 Because the home’s yard became such an important part of the home’s design, the landscaping was designed to feel like an extension of the home, with a fountain, concrete bench wall and natural, clean landscaping. 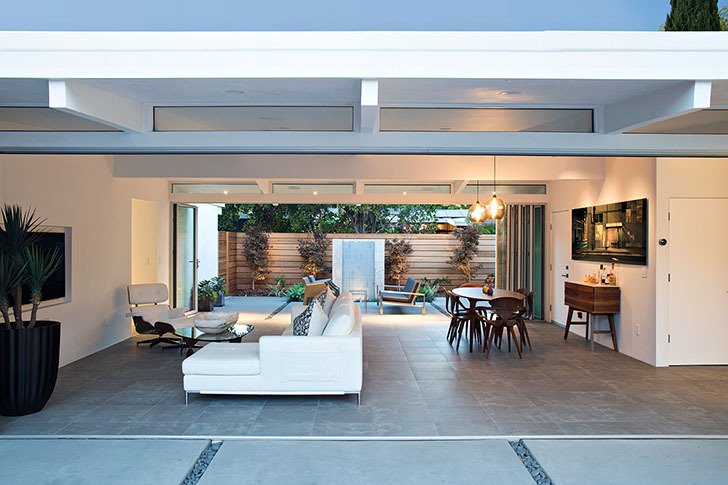 The glass walls of the home open up to blur the lines between inside and outside. 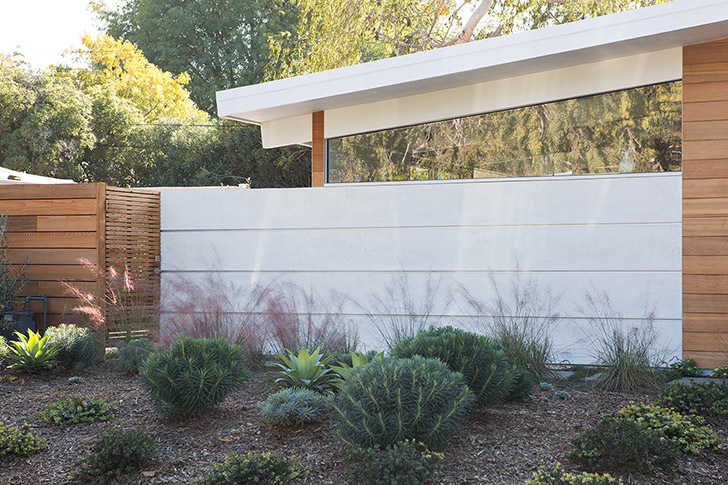 Wood fencing on the exterior blends seamlessly with the finishes on the interior. 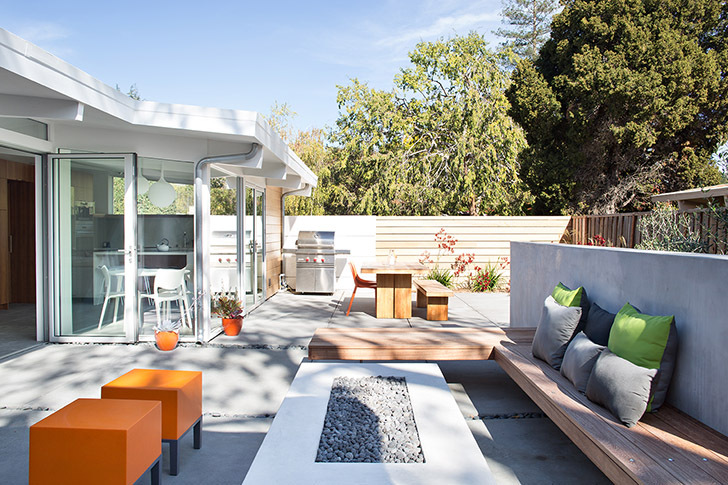 The homeowner loved the home’s original fireplace, but it interfered with the clean view that the open area provided, so the fireplace was reimagined as a fire pit outside the anchors the outdoor living space without obstructing the light. 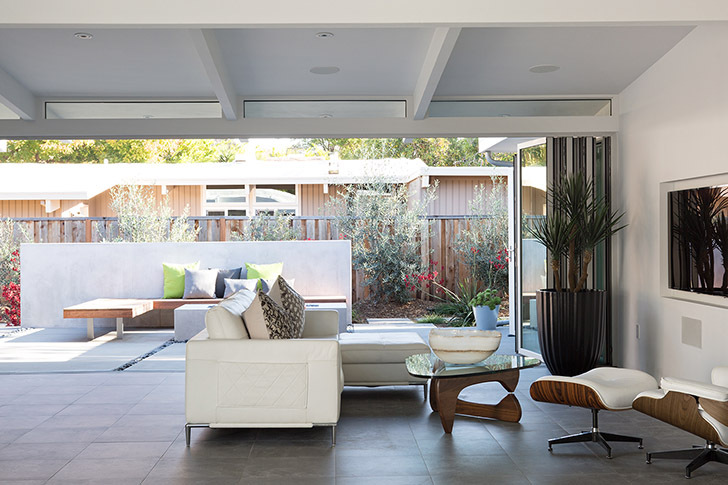 Klopf Architecture recently remodeled a classic Eichler mid-century home, honoring the iconic home’s style while expanding it to suit the needs of the new homeowner. 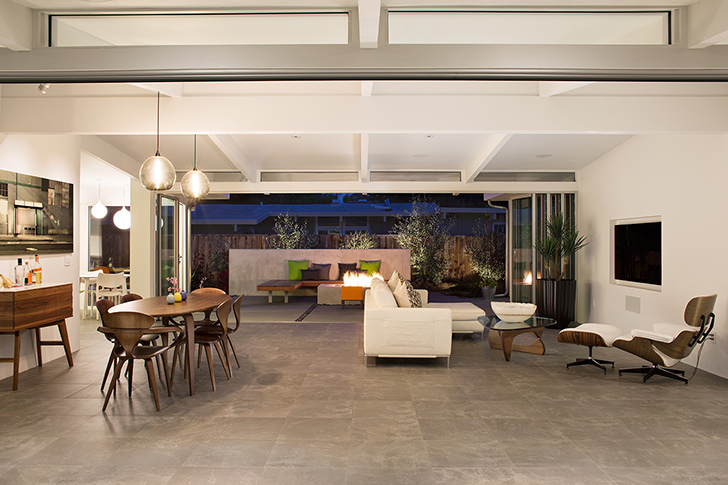 Working alongside Arterra Landscape Architects and Flegel’s Construction, Klopf opened the home to the surrounding landscape. 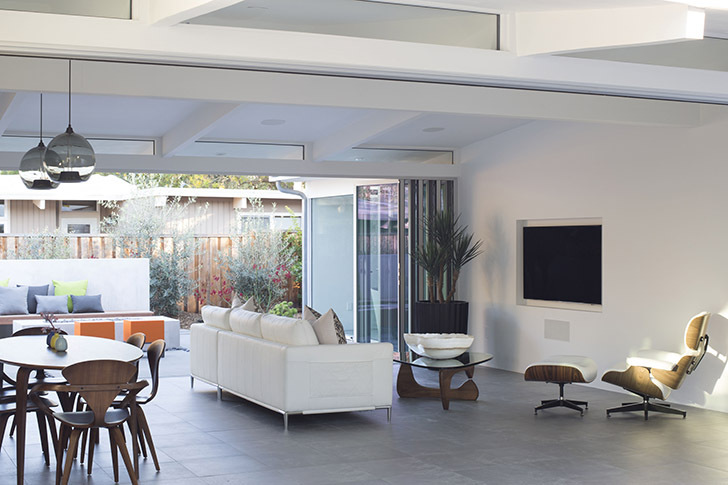 The airy pavilion-like renovation provides the best of indoor and outdoor living, and allows the home to be naturally cooled by California’s breezes.